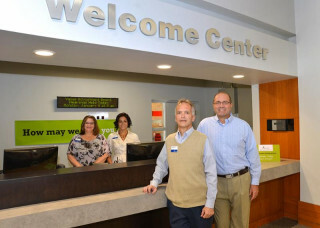 A new customer service desk officially has opened in the Sarasota County Administration Center, located at 1660 Ringling Blvd. in Sarasota, as part of an effort to better serve the public, the county has announced. Customer service representatives who can provide information and help direct visitors will staff the welcome center from 8 a.m. to 5 p.m. Monday through Friday, a news release says. The addition is part of a larger plan to renovate the downtown building, the release notes. In late 2014, the exterior of the structure was painted, and overgrown landscaping was replaced by Florida-friendly, native plants, the release adds. Further improvements are planned for the remainder of the lobby in 2016, the release notes. “It’s been exciting to see these renovations come to life at our downtown building,” Harmer said in the release. For more information, call the Sarasota County Contact Center at 861-5000 or visit www.scgov.net.